Twenty-something years later in a New York gift shop on Liberty Island I found myself venturing over to the novelties when I came face to face with my childhood hero. 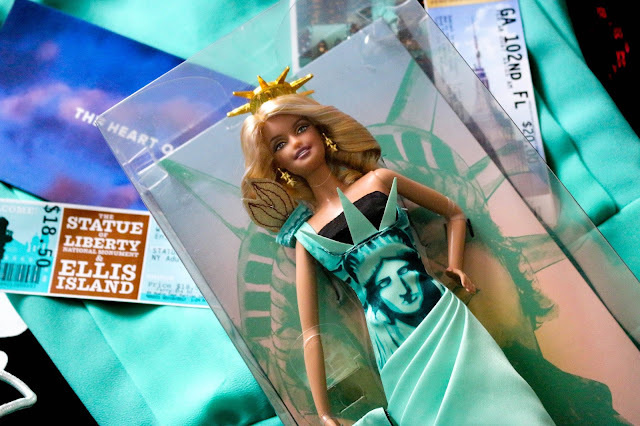 An immaculate and empowering display of Limited Edition Liberty Barbie dolls. I couldn't help but hide the excitement, and pure joy at finding such treasure. It was the same magnetism I felt towards many childhood character of mine, I was one hundred and ten percent infatuated with this doll. So, there was no question of doubt that Barbie was coming home across the pond with me. Only in New York there’s a certain kind of magic that allows a grown-up woman to buy a Barbie doll. When I was younger there was one friend of mine who would receive a Barbie doll every year without fail since birth from her parents. I fell in love with the idea, and always stored it as a sweet memory. Maybe, I might pass Liberty on as a gift one day to my little one (if she's a girl), but for now she's all mine.